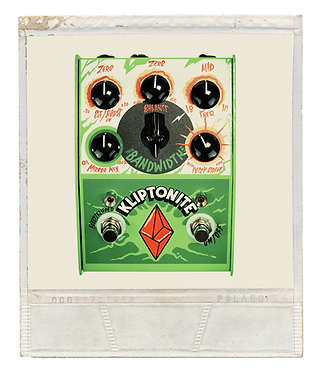 Kliptonite is a true Dr. Jekyll and Mr. Hyde situation, sporting both a smooth and bluesy overdrive circuit as well as a rippin’ velcro fuzz, letting you go from mild to wild, simply at the stomp of a switch. Plus with the Mirror Mix, you can blend the two circuits for a wide variety of sane and insane tones. Now add in pin-point precise tone control via the Paracentric EQ, as well as on-the-fly tone sculpting or foot-controlled phaser and wah sounds via the optional Stone Deaf EP-1 active expression pedal and you have one of the coolest and most versatile dirt device currently on the market. Split Personality Distorter Kliptonite is a true Dr. Jekyll and Mr. Hyde situation, sporting both a smooth and bluesy overdrive circuit as well as a rippin’ velcro fuzz, letting you go from mild to wild, simply at the stomp of a switch. Plus with the Mirror Mix, you can blend the two circuits for a wide variety of sane and insane tones. Now add in pin-point precise tone control via the Paracentric EQ, as well as on-the-fly tone sculpting or foot-controlled phaser and wah sounds via the optional Stone Deaf EP-1 active expression pedal and you have one of the coolest and most versatile dirt device currently on the market. • Powered by opt. 9V PP3 battery or PSU (9V DC, centre -, 2.1mm, ~30mA current draw) Combining a Paracentric EQ, Mix knob (between fuzz and overdrive), expression control and dual channel foot-switchable operation, the Kliptonite is one of the most exciting fuzz and overdrive combinations that you are ever likely to experience. However, Kliptonite’s most unique feature is the ability to mix the overdrive and the fuzz circuits in parallel in either of the distinctive tone’s favour and switch using the footswitch in a flip-flop fashion between the two. So for example, you could set 75% overdrive and 25% fuzz, push the foot-switch flipping the signal to the other channel and then have 75% fuzz 25% overdrive. While the overdrive can give you a creamy bluesy tone, the fuzz on this pedal is a velcro type fuzz, so don’t expect smooth endless sustaining notes, instead expect ripping, spluttery madness that’ll make your riffs stick out with true ferocity. Add a Stone Deaf EP-1 active expression pedal to the expression input control and on top of the impressive regular tone shaping features, Kliptonite can also achieve wah, phaser and manual tonal shift tones as well as the ability to control your tone on the fly with your foot. *** Please note *** The expression input will only work with Stone Deaf EP-1 active expression pedal. Each Kliptonite is proudly manufactured by Stone Deaf in our factory based in Manchester, England.